The MMV conference provides a forum for research presentations and the exchange of information and experience of managerial policies, problems, practices and solutions regarding issues related to the monitoring and management of visitor flows in recreational and protected areas. Special interest is focused on the management of international nature tourists. The first MMV conference was held in Vienna, Austria, in winter 2002. The growing concern about increasing recreational use of protected areas and concern about the limits of ecological carrying capacities in these areas in many parts of the world were the motives to share experiences and know-how. The first conference was a great success, and the idea of a follow-up conference was supported after Vienna conference. Dr. Rauno Väisänen, Finland: Visitor information needs and it’s implementation in management of recreational and protected areas: Managers’ perspectives. The conference welcomes researchers and scholars working with the topics of the conference, as well as park staff and managers dealing with visitor management in recreational and protected areas. 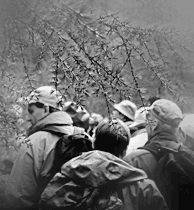 Students of recreation and nature tourism studies are offered a special student fee. There are plenary sessions with international acknowledged keynote speakers and a number of sessions for paper presentations. There will be a number of workshops dealing with special issues or ideas for cooperation. Topic suggestions are welcome up until April 30, 2004. There are two poster sessions. The conference will be held on Wednesday June 16th to Sunday 20th, 2004. The program includes three days of plenary sessions, paper presentation sessions and workshops. Field trips to national parks, wilderness areas and nature tourism enterprises will be organized after the conference. Abstracts of paper and poster presentations can be submitted related to one of the ten topics. A paper presentation is limited to 20 minutes followed by 5 minutes of discussion. Poster presentations will be organized in 60 minutes session, during which the authors(s) must be available for questions and discussion. Only one presentation is allowed per person. Instructions for posters are available on the conference web page or from the conference secretary. Deadline for submission of abstract, December 8, 2003. Notification of acceptance will be delivered by December 20, 2003. Submission of full manuscript, February 28, 2004. Pre-registration is recommended together with submission of the abstract. Final registration starts in January 2004 with detailed information about payment options (credit card, bank transfer, invoice). The registration fee is 300 euros for early birds (by February 28) and 350 euros later. The fee includes congress proceedings, mid-congress excursion, lunches and refreshments, Arktikum museum fee. Post-conference tours are prized separately. Students and participants from Eastern Europe and Third World countries will have a reduced fee. Registrations should be submitted via the conference web page http://www.metla.fi/tapahtumat/2004/mmv2 (Final registration) or directly to the conference secretary Ms. Eija Virtanen by e-mail eija.virtanen@metla.fi or by fax +358 10 211 4401 or by mail addressed to Finnish Forest Research Institute, Rovaniemi Research Station, P.O. Box 16, FIN-96301 Rovaniemi, Finland. Final registration continues till May 15, 2004. (seija.tuulentie@metla.fi) and Eija Virtanen (eija.virtanen@metla.fi).